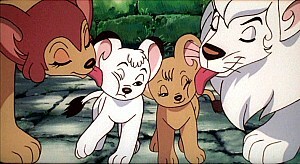 In 1997, a big-budget, theatrical movie, called Jungle Emperor Leo, was released in Japan. 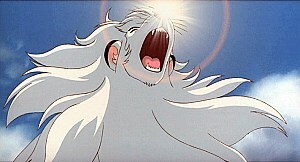 This movie returned to Dr. Tezuka's original manga and is reasonably faithful to it. 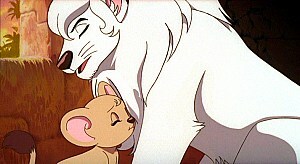 The movie begins with the birth of Leo's (Kimba's) cubs and follows to the end of the original published story. Click this picture to get the movie on DVD. Also check out Osamu Tezuka's OWN REVISION of this story! 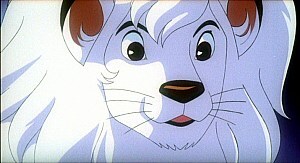 Somewhere in East Africa lives a white lion named Leo (Kimba grown up), ruler of the jungle. Leo lives happily with his wife, Riya (Kitty grown up), and their two children, Rune and Rukio. All is peaceful until one day when a ruthless mercenary and his group come to the jungle in search of the moonlight stones (ref. the Leo The Lion TV series, episode 8). Only concerned with making money, the humans have absolutely no regard for the animals they encounter. The animals quite naturally are opposed to the intruders storming their jungle. At the same time, a highly contagious disease sweeps through the jungle. 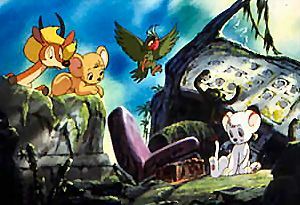 Jungle Emperor Leo is based on the second half of Dr. Tezuka's original manga story. It keeps the basic story of the original manga even though Tezuka himself had changed the outcomes of the story in 1966 for his Leo The Lion TV series. I guess it was just a creative decision to revert to the older story of the manga, but a lot of people were severely traumatized by the movie. When they see Tezuka's revised story from the last two episodes of the Leo The Lion series, they're happy again. Click here for my own review of this movie, as released by AnimeWorks on DVD. 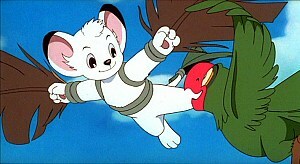 Some are captures from the movie, some are promo pictures released by Tezuka productions; these latter may not be found exactly in the movie. Leo (Kimba) sees Rune and Rukio for the first time. Rune and Rukio are prepared for their presentation to the world. Exploring an old crashed airplane. Rune would do anything to fly. Rune is swept away in a flood. Rukio contracts a deadly disease. 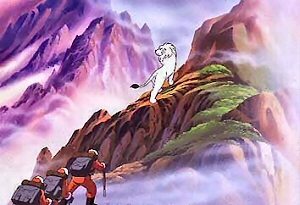 Leo leads an expedition up Mount Moon. 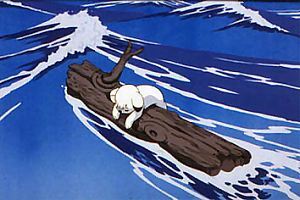 Click here for some publicity stills published by Tezuka Productions before the movie was released to theaters in 1997, showing scenes that were not part of the finished movie. The following commentary was written by Don Marks and is quoted from his page. 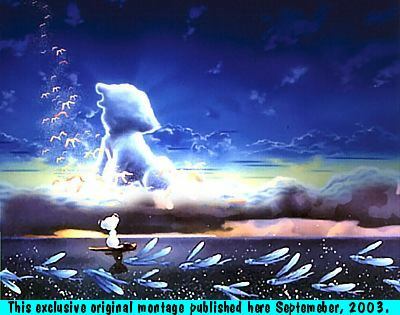 He wrote it after seeing Jungle Emperor Leo at the 1998 FantAsia Film Festival in Toronto. This was, I believe, the first North American showing of this film. 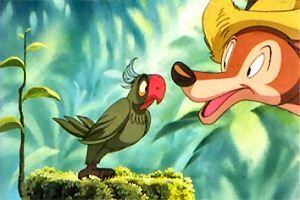 Julian Grant introduced the film by noting that Disney filed suit to stop them from showing the film. Interesting.... Still, the source material this film is based on, classic manga from Japanese cartoon giant Osamu Tezuka, precedes that Disney film by a good 20 years, so who's to say who is ripping off whom? 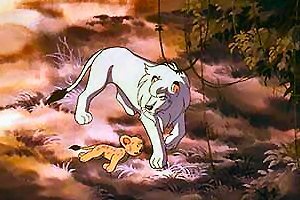 In any case, while both are children's movies that unashamedly tug at the heartstrings, Jungle Emperor Leo edges out Lion King because it simply does a better job, taking a few more chances along the way. The story here sees the mighty king of the Jungle, Leo, trying to protect his family and animal subjects in the face of an onslaught of humans searching for a powerful stone that might solve their energy problems. There's your typical evil, opportunistic men ready to destroy everything in their path just as there is one or two good men who are concerned with the animals' well-being, but the film goes a surprising distance on this simple framework. It takes the story to extereme lengths, venturing far into harsh terrain where the danger inherent in the evil men, both to themselves and the animals, is magnified into chaos. Similarly, Leo's sacrifice to save the human who helped him carries incredible weight in these circumstances. Rune's discovery of his pelt sheltering the human would be some kind of sick joke if it wasn't so emotionally powerful. The final shot of Leo's silhouette made of clouds in the sky should be a cliché, but instead it becomes the final acknowledgement of the mythic undercurrents of the story. Classic Japanese cartoon character designs, very unlike the streamlined look of modern anime, contribute to the film's broad story; and goofy names, like Mr. Ham-Egg, add a generous dose of humour to the proceedings. Leo, on the other hand, has an immense majesty in his simpler, iconic design. Looking nothing like any Japanese cartoon I have ever seen, Rune's dream sequence of his impression of what man's world must look like is phenomenal. It sits somewhere between Robert Crumb and Schoolhouse Rock, a carnival of shapes and colours where every person looks like the only man he has ever met. This page changed 2 January 2008. Original text ©2003-2007 Craig Andersen.